Deciphering place names in Northern Alsace? 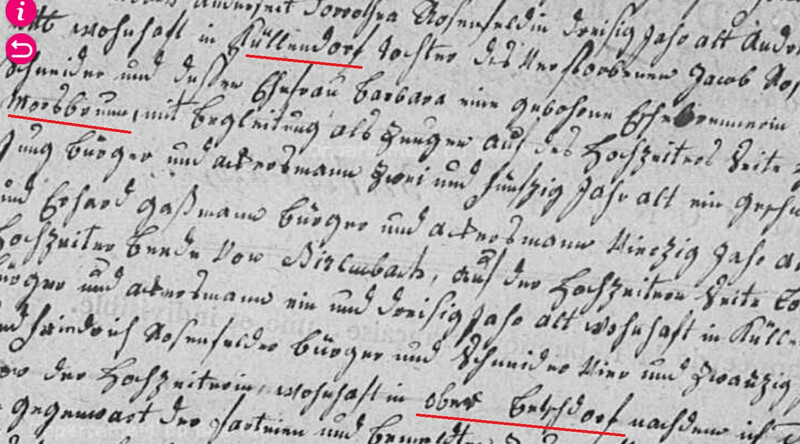 I am having some difficulties with a 1797 marriage record from Birlenbach, Northern Alsace (departement Bas-Rhin), specifically some of the geography. The record is hard to retrieve (all they let me download is a PDF file, which I am having a hard time annotating properly). The original record is at http://archives.bas-rhin.fr/detail-document/ETAT-CIVIL-C42-P1-R47843#visio/page:ETAT-CIVIL-C42-P1-R47843-2924074. I have also captured the screen in order to highlight the place names I am interested in. The first name I read rather clearly as "Kullendorf", but I cannot find a place with that name. The closest I have come is "Kuhlendorf", about five kilometres southeast of Soultz-sous-forest, 10 km from Birlenbach. The third name could be "Oberbetschdorf", which would be consistent. There is a "Betschdorf" about two kilometres southwest of Kuhlendorf (with a "Niederbetschdorf" immediately to the East). Kuhlendorf is also a part of Betschdorf today. The second name is the biggest mystery. I read it as "Mordbrunn", but I have doubts about my interpretation, and I have not found anything that fits. Can anyone shed more light on these three place names for me? Browse other questions tagged 18th-century palaeography france place-names or ask your own question. How should place names be recorded? Meaning of term Sojourner on 1794 Marriage Record at Marystow (Devon) for John Creber? How to read Swiss Church Book / Kirchenbücher Collection Indexes? Locating pre-emigration records in Ireland for Peter Starrs born abt 1836 and relations? Can someone sort out a tricky wedding party for me?